Living in a cooler seasonal climate means that at the end of a long summer, it's time to winterize your pool. The air gets colder, and you can no longer enjoy the pool the way you did in the summer. One of the many steps in closing your pool is draining the water. The amount of water you drain from the pool will depend on the type of pool you own. Draining a portion of the water is an essential part of winterizing a swimming pool for the season. Partially draining the water from your swimming pool allows you to disconnect the filter from the pool without the water spilling from the filter connections. The water must also be partially drained to protect components such as the skimmer and return jet from freezing and expanding in winter's frozen temperatures. Once you've drained the water, place an airtight rubber plug in the return jet, and attach a skimmer plate inside the pool on the skimmer opening. According to the Association of Pool and Spa Professionals, the amount of water you drain from your pool depends on several variables. If you have an above-ground pool with a vinyl pool liner, drain the pool to about 1 inch below the bottom of the skimmer mouth. It's acceptable to drain the pool a few more inches below that if you live in an area that gets heavy precipitation during the winter months. Some pool professionals even suggest draining the water to as much as 6 inches below the skimmer — about the level of the bottom of the pool's return jet. The return jet is usually installed a few inches below the pool skimmer. In-ground pool draining requirements are similar to those of their above-ground counterparts. Drain the water down to no more than 6 inches from the bottom of the skimmer if you plan to use a standard floating winter cover. Use your pool filter, switched to the "Drain" setting, to empty the pool water. Attach a pool hose to the end of the filter opening that leads to your yard's drain to avoid flooding. This will allow you to turn off the filter and drain the pool slowly through the filter. There is one exception to the standard rules for above-ground and in-ground pools: If you plan on using a mesh pool cover, drain your pool down 12 to 18 inches. Mesh pool covers are most commonly used on in-ground pools, but they are manufactured for above-ground pools, as well. A mesh cover is a porous cover that keeps out dirt and debris while slowly allowing your pool to fill up with precipitation. 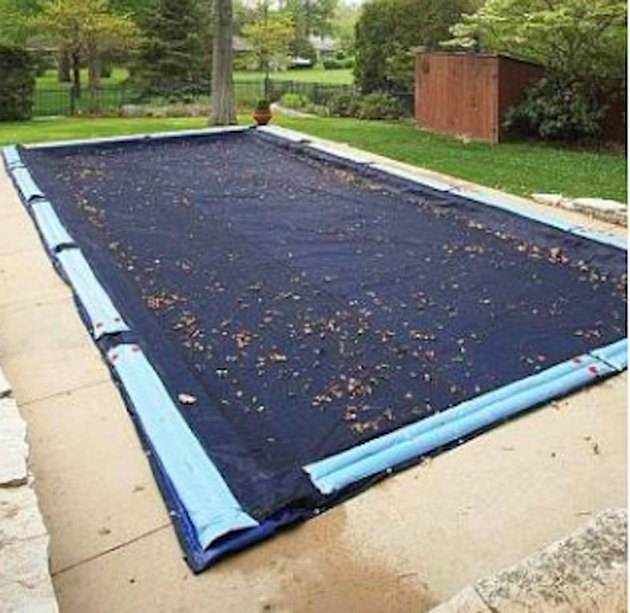 The mesh covers helps fight evaporation during a long winter, but it requires you to drain more water, since during the winter months water will be slowly added to the pool.